On 9/11 we asked, Why do they hate us? Now it’s time to ask, Why do we? Watching a nature documentary these days, despite great technical strides in film-making and perhaps because of them, it is hard not to feel we are saying goodbye to everything – every species, including ourselves, and plants and trees and whole ecosystems besides. That sensation becomes more chilling and blatant in the new Netflix series “Our Planet,” particularly in one brief scene in the second episode, entitled “Frozen Worlds,” of walruses in northeast Russia, not far from the Bering Sea coast. The episode is meant to show the effects of climate change in the arctic, on melting sea ice. 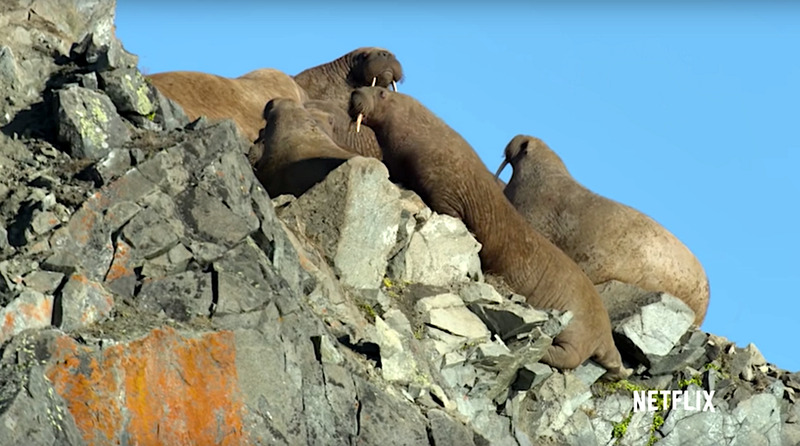 And so we see walruses, filmed in late 2017, in a mass haul-out on a rocky beach, something walruses have periodically done for more than a decade now. At Point Lay, in northwest Alaska, across the Chukchi Sea from Russia, tens of thousands of walruses have hauled out since 2007, during years of complete sea ice loss, according to the The U.S. Geological Survey. Their eyesight is much worse on land, and cows and calves have been crushed in deadly terra firma stampedes. In the scene from “Our Planet,” an outtake, several hundred walruses lumber up the rocks about 260 feet above the beach where thousands are milling. “Once at the top... they rest, until it’s time to return to the sea in search of food,” says narrator David Attenborough. “It’s really steep,” Lanfear says. One walrus lets go, and we see it, falling in slow-motion; then a cut to Lanfear, covering her mouth with her hand, eyes wide; and the walrus, tumbling to its death. It is hard to say what is more shocking, the great pinniped falling or Lanfear’s reaction, plus the possibly inexplicable: Several hundred walruses follow suit. We do not know why. “This is the sad reality of climate change,” Lanfear says. “They’d be on the ice right now if they could be, but there’s no other option but to come to land.” A tear rolls down her cheek. We are not crying; she is. We thought of the “falling man” photo from New York on 9/11. A walrus is not a human any more than a hippopotamus is a bird, yet is this not the filmmakers’ point, about the world we share? Ed Yong at The Atlantic has done a good job examining this scene. Some scientists question whether fatally plummeting walruses can be linked to climate change. What is not in doubt is that climate change is harming walruses, putting them on land and putting every other kind of fauna and flora at risk in the arctic, the subarctic and across the rest of the planet. We still do not know if or how we can adapt or change to survive it. The tumbling walruses are hostages to our fortunes. The walruses cannot blame us. How could they, when even with our science, we cannot agree whether we are at fault? But we are witnesses, and we are implicated. After 9/11, we asked, “Why do they hate us?” Watching these magnificent falling beasts, we have to think about what is happening here and ask whether we care enough to find practical ways to stop it. Perhaps this does not have to be the long goodbye, but we at least must absorb the toll of change, and we can start right now by doing it like Sophie Lanfear, a walrus at a time.